How did Larry Hogan, Maryland's Republican governor, survive the blue wave? The votes were hardly in when the Washington Post started explaining why Republican Gov. Larry Hogan won re-election in deep blue Maryland. It was largely due “to his moderation,” the Post claimed. 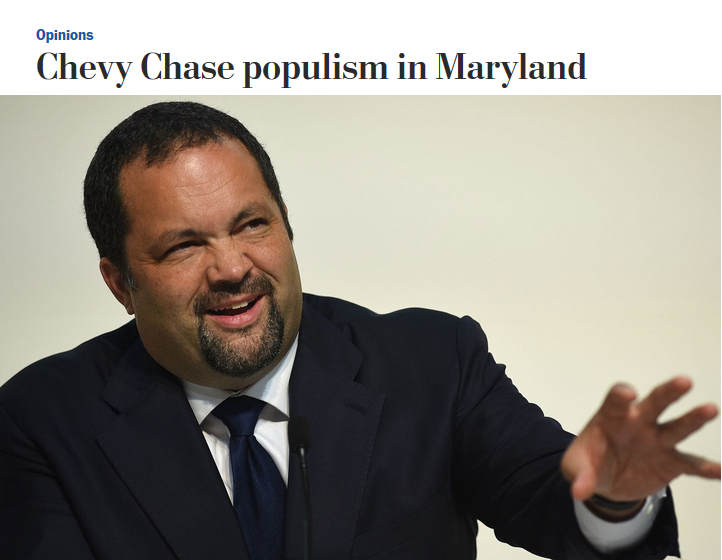 As it shilled for Hogan, the Post — which is influential in much of Maryland — simultaneously painted his opponent, Democrat Ben Jealous, as too extreme, even though most Marylanders supported his platform, which included Medicare for all, free state college tuition and a $15-an-hour minimum wage. Larry Hogan’s re-election bid was backed by an unprecedented $19 million campaign war chest and a deep pool of outside money, in particular from the Republican Governors Association, where Hogan serves as vice chair. With a comparative pittance in the bank — and little financial help from the Democratic Party — Jealous had to rely on the media to relay his progressive platform to voters. But the Post made this difficult by burying Jealous’ popular policies under unflattering coverage. Jealous repeatedly denied being a socialist (“I’m a venture capitalist, not a socialist”), but the Post kept raising the issue, turning this line of questioning into a line of attack — one which Hogan and the RGA were aggressively pursuing at the time. Hogan’s media success rests in part on some very old and ugly tactics. I can’t overstate how troubled I was by the way the RGA ads framed Jealous visually in darkness and shadows and consistently showed him with facial expressions that would best be described as snarling, glaring, frustrated or angry. There is a history of African-American men being depicted this way in media, and it’s disturbing that Hogan’s allies would go there. Rather than joining the Sun in condemning these ads, the Post eagerly cited them. The Post was as hard on Jealous as it was gentle on Hogan, whom it described as a “jocular,” “frustrated Everyman.” The Post’s treatment of Hogan — whose right-wing politics align with the paper’s — wasn’t just over the top, it was calculated. To win re-election in deep blue Maryland, Hogan had to appear “bipartisan,” “moderate” and “pretty much the opposite of Trump,” which is how the Post portrayed him. Meanwhile, the Post hid the fact that Hogan was aided by the Tea Party movement, is backed by the right-wing Koch brothers, is close friends with Vice President Mike Pence, and is not that far removed from some far right-wingers. But forget all that. What the Post needed readers to know was that “Hogan’s popularity among blacks has flourished.” Polls showing this were prominently featured by the Post, while a poll showing otherwise was buried, as was former President Barack Obama’s endorsement of Jealous. The Post’s efforts and Hogan’s millions help explain why Hogan’s black support doubled from 2014, reaching 28 percent, according to a survey by Fox News and the Associated Press. Still, Hogan lost the black vote by a yawning 43 points to Jealous, which might surprise Post readers, since the paper disproportionately quoted African-Americans critical of Jealous and praiseful of Hogan. Highlighting Hogan’s black support served two purposes. 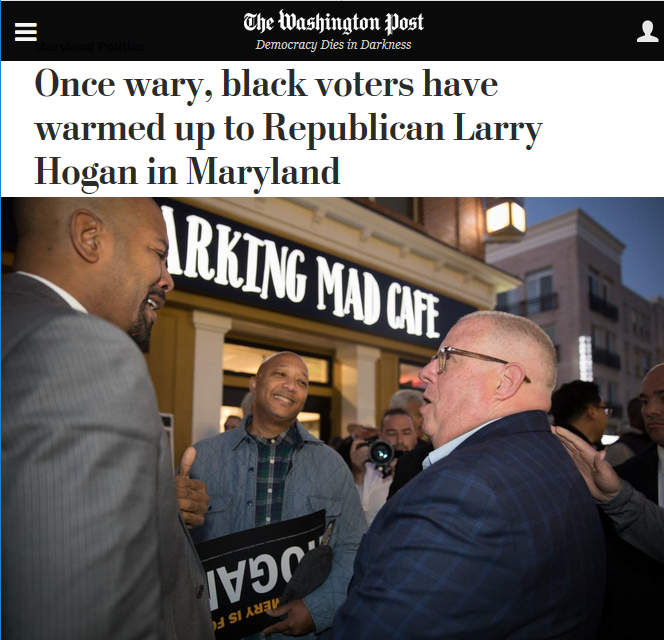 It helped Hogan get a second look among black voters, who may have been reluctant to go along with the Post’s choice, because of the paper’s past targeting of candidates with black support. And it also may have given white Democrats — a core readership of the Post’s — permission to vote for Hogan, since doing so seemed to be a multicultural thing. The Post’s strategy seems to have worked, as Hogan — who improved on his 2014 showing in every county — made some of his biggest gains in Montgomery and Prince George’s, where the Post’s shadow is most heavily cast. By preventing Jealous from running up the score in these vote-rich Democratic strongholds, Hogan, who dominated the whiter, more suburban and rural jurisdictions, won decisively, becoming just Maryland’s second Republican governor to be re-elected. Even as Hogan doubled his support in Prince George’s from 2014, the county, which is majority black, went overwhelmingly for Jealous. Still, the Democrat likely would have won Prince George’s by more votes if not for widespread voting irregularities. 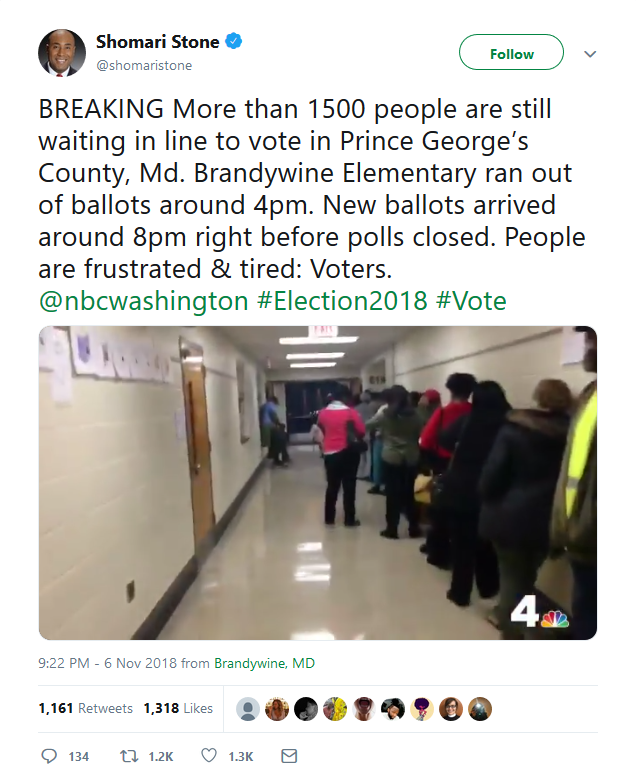 On election day, over a dozen Prince George’s polling places ran out of paper ballots, leading to long waits and an unknown number of people leaving without voting. At one precinct, over 1,500 people waited in line, some for four and five hours. “We just trying to get our vote in, get our voices heard,” a “totally exhausted” man told NBC4’s Shomari Stone. “The conditions that bring about five-hour wait times, or thousands standing in line… are concentrated overwhelmingly in minority precincts,” Carol Anderson, chair of African-American Studies at Emory University, writes in "One Person, No Vote: How Voter Suppression Is Destroying Our Democracy." These “long, seemingly interminable lines,” which are often artificially created by providing fewer resources and poll workers to minority precincts, are one of the tools used by Republicans, who “clearly believe their future success depends more on constricting rather than convincing the electorate,” writes Anderson. Throughout Maryland, elections are overseen by Republican-led, and frequently Hogan-appointed, boards of elections. For the Post, the farther away voting irregularities took place, the more alarming they seemed to become. The power of the Post’s full-throated support may be most apparent not in Hogan’s win, but in the losses of his fellow Republicans. Come January, the congressional delegation for the immediate Washington region — the Post’s primary coverage area — will be entirely Democratic. Barbara Comstock, a Republican from Northern Virginia, was the lone holdout, but she lost her swing district decisively this election. The congressmember wasn’t helped by the Post, which tied her to Trump, who is deeply disliked throughout the region. On issues like the president’s push to freeze federal pay (Twitter, 8/30/18) or his controversial pick for the Supreme Court (11/1/18), the Post made Comstock answer for her party’s leader — something the paper carefully avoided doing to Hogan. Like Comstock, a number of Hogan’s fellow Maryland Republicans will soon be out of a job. Unlike the governor, they had to face the electorate without the Post’s protection, and it didn’t go well for many of them, even as Hogan notched a historic win. On election night, an ebullient Hogan boasted that the blue wave was no match for him. “It turns out I can surf,” said the governor, who neglected to thank the Post for giving him his surfboard. Pete Tucker is a journalist based in Washington. Follow him on Twitter at @PeteTucker.